The chemical process industry enjoyed a building boom in the 1960s in many parts of the world. As these plants aged, corrosion failures associated with the presence of thermal insulation became more frequent. The term most commonly used to describe this problem is "corrosion under insulation," or just CUI. The dramatic increase in CUI led to a major effort within the corrosion engineering community to understand the nature of the problem and to define practical solutions that could be applied to both new and existing systems. CUI was identified as a problem even before the chemical industry as a group "discovered" it. In 1957, A.W. Dana Jr. published "Stress Corrosion Cracking of Insulated Austenitic Stainless Steel" in the ASTM Bulletin, and H.F. Karnes presented "Corrosion Potential of Wetted Thermal Insulation" at the 57th national meeting of the American Institute of Chemical Engineers. Both Dana and Karnes conducted extensive testing showing that corrosion could be caused by the leaching of chloride and fluoride ions from the insulation materials in use at the time. Karnes’ work showed that leachable sodium and silicate ions could partially inhibit the corrosive effects of the halogen ions. As a result of research like this, the manufacturing processes and standards to which insulation materials are made evolved to provide materials much less likely to be the direct cause of corrosion, yet CUI remains a major problem for the chemical process industry today. Let me describe CUI-related corrosion mechanisms and how they relate to insulation materials and the design, installation and maintenance of insulation systems. In addition, I will review some examples of CUI problems that are commonly encountered, even today when CUI and its control are very well understood. Corrosion takes many different forms, depending on the nature of the material being corroded and the environment that is causing the corrosion. In the chemical process industry, the most commonly used materials of construction are the carbon steels and 300 series austenitic stainless steels. Each of these alloy families is subject to specific forms of insulation-related corrosion. When bare steel is subjected to water on a regular basis, it rusts. Eventually, if the rusting is not controlled, the steel will get so thin that it can no longer function as intended. This type of rusting is called general corrosion because it produces broad uniform damage rather than a localized effect. The important variables are the amount of water–often referred to as time of wetness; temperature–generally temperatures between -4 and 150 C; and contaminants that make the water more corrosive–typically chloride or SO2. The effects of chloride on the rusting of steel are shown by atmospheric corrosion data that has been collected in coastal zones. The measured corrosion rates of steel within a few hundred yards of the shoreline, where humidity and chloride deposition are high, are substantially higher than for steel exposed only a mile inland. In contrast, the rate of corrosion for steel in the southwest desert is very low due to the natural low humidity and atmospheric contaminant levels. The 300 series stainless steels do not experience general corrosion or thinning under wet insulation, but they are subject to another form of corrosion that will be discussed later. What do time of wetness and the presence of contaminants have to do with insulation and corrosion? Plenty. When insulation is either not properly installed or not properly maintained, it collects water and dramatically increases the time of wetness of the insulated surface. Further, depending on the plant location, the source of water will add contaminants to the insulation that accelerate the rate of corrosion. When the insulated system operates at elevated temperature, the insulation can produce a concentrating effect through wet and dry cycling that increases the concentration of contaminants in the insulation, thereby increasing the corrosivity of the wet insulation. A properly specified and installed insulation system prevents CUI by not allowing moisture to reach the insulated substrate. Attention to details such as properly overlapping jacket joints, installing the required flashing and the correct use of sealants are absolutely necessary to produce an insulation installation that properly sheds water and prevents substrate corrosion. Low-temperature systems must not only shed water, but also prevent the ingress of moisture vapor that condenses on the cold surface. Unfortunately, years of practical experience have shown that insulation systems, no matter how well designed and originally installed, eventually lose the ability to shed water. 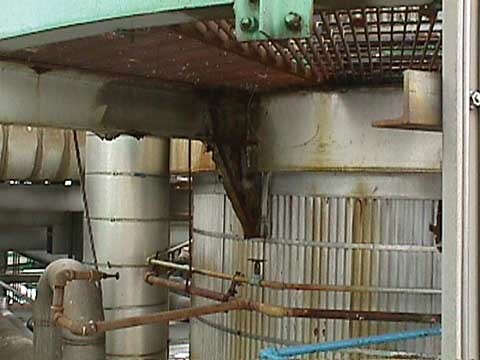 This deterioration occurs for many reasons, including the shrinkage and embrittlement of elastomeric sealing compounds and mechanical damage caused by the inevitable maintenance of an operating chemical plant. Routine maintenance on insulation is usually a low-priority task since many operating departments cannot easily detect the immediate effect of insulation damage. In this age of limited maintenance budgets and manpower, maintenance is focused on equipment that has a direct and easily perceived impact on operating reliability: this in spite of studies showing that CUI has a major impact on maintenance budgets. An approach used by some insulation designers to control CUI is to select an insulation material that does not absorb moisture. While classes of insulation materials differ in their ability to resist moisture absorption, all insulation materials can be made to absorb moisture that subsequently provides the conditions for substrate corrosion. Fibrous insulations are well-known for their ability to absorb moisture, but less well-understood is that even closed cell insulations will absorb moisture. For example, when cellular glass or thermoplastic closed-cell material is exposed to freeze thaw thermal cycling, the individual cell walls can fail and allow moisture to fill the cell. At the next freezing cycle, the expansion of the water in the cell causes damage to the adjoining cells, and the moisture penetrates further into the body of the insulation. In general, closed-cell insulations are more resistant to moisture absorption than fibrous or granular insulations; however, they are not immune to absorption and are not by themselves a solution to CUI. An early Japanese study by Mikio Takemoto of Aoyama Gakuin University, published in the National Association of Corrosion Engineers (NACE) book, "Corrosion Under Wet Thermal Insulation," correlated CUI with insulation type and showed that all the common insulation materials in use at the time, including cellular glass and closed cell polymers, were associated with CUI failures. While the 300 series stainless steels are not subject to general corrosion under wet insulation, they are subject to localized corrosion. As the name implies, localized corrosion affects only specific "local" areas rather than the broad surface of the metal. With stainless steel it takes the form of pitting, crevice corrosion and stress corrosion cracking (SCC). Stainless steel gains its ability to resist corrosion by forming a passive layer on its surface. Localized corrosion occurs when the passive layer breaks down in specific locations, at which point the rate of corrosion is greatly accelerated. 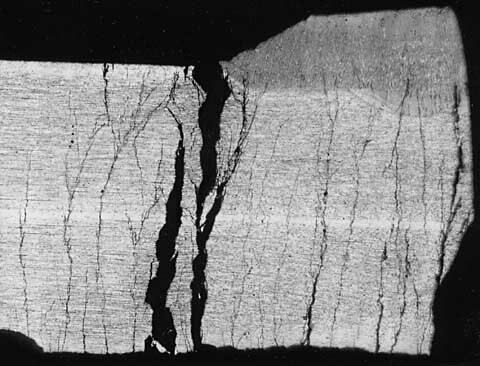 Stress corrosion cracking is a special form of localized corrosion that results in cracking of the metal and, under severe circumstances, can lead to catastrophic failure of the component. Figure 1 shows a perfect example of severe SCC. In general, three conditions are required for SCC to occur: the presence of a susceptible material–in this case, the 300 series stainless steels; a cracking agent that is specific to the susceptible material; and the presence of tensile stress that is greater than some threshold stress intensity. While chloride ion is the most common cracking agent for 300 series stainless steel, the other halogen ions can also cause SCC under the right environmental conditions. Tensile stress is usually present in stainless equipment as a result of operating loads; however, the residual stress left in the metal by fabrication and welding operations is usually sufficient to drive SCC when the environmental conditions are right. Two critical environmental variables that dictate whether or not SCC will occur are a metal temperature greater than 50 C and the presence of liquid water. At lower metal temperatures, it is possible to have high levels of chloride and stress without having SCC. Temperatures can be sufficiently high that even though chloride and stress are present, the surface of the metal will not support liquid water and cracking will not occur. How does insulation relate to SCC? When insulation is properly installed and maintained, it prevents the presence of moisture at the surface of the insulated item. A properly insulated stainless steel pipe can operate at 90 C in a high-chloride, ambient environment for many years without an SCC failure. However, when the insulation system can no longer prevent moisture penetration, the conditions for SCC can occur inside the insulation. In coastal and some industrial environments, the atmosphere can be a source of both chloride and water. Rainwater can carry chloride into the insulation, where it concentrates and eventually reaches a level that supports SCC. At one time, some insulation materials contained chloride from the manufacturing process that could be leached out of the insulation and deposited on the surface of the insulated item. Today, most insulation is manufactured without leachable chloride or with inhibitors that help retard SCC. However, SCC under insulation continues to be a problem because of poor maintenance and external sources of chloride. Proper installation and maintenance of insulation systems are critical. NACE International has published a recommended practice, RP0198-2004: "The Control of Corrosion Under Thermal Insulation and Fireproofing Materials–A Systems Approach" that details how to prevent SCC under insulation. Experience has shown that immersion-grade coatings should be used on insulated stainless steel equipment that is likely to operate in an environment where external moisture and chloride will eventually penetrate the insulation system. The two case histories below serve to illustrate corrosion that is directly related to the presence of thermal insulation. In the first case the insulation was neither specified correctly nor properly installed or maintained. In the second case the specification was adequate, but years of neglect led to problems. 1) A plant composed of numerous carbon steel vessels operating at temperatures around -40 F was insulated in the early 1980s using cellular glass insulation with aluminum jacket. Cellular glass was chosen because of its good resistance to moisture penetration in low-temperature applications. The specification did not require the insulation to be extended onto any items that were attached to the vessels, such as platform supports or nozzles. As a result the surface temperature of all these attachments was below the ambient dew point temperature most of the time the vessels were operating. This caused extensive general corrosion of the platform supports and many of the nozzles, causing the operator to condemn the platforms and take the vessels out of service for extensive repairs. Figure 2 shows an example of the support damage, and Figure 3 shows how the insulation should have been installed. Had the insulation been properly specified with the insulation extending out on the supports and nozzles, this corrosion would not have occurred. While this is not strictly an example of corrosion under insulation, it shows how general corrosion can occur in low-temperature systems that are not properly insulated. In this case, even though the insulation was thoroughly saturated with moisture that was in the form of ice at the surface of the column, no corrosion occurred under the insulation. Only outside the insulation, where the steel stayed continuously wet and the temperature was much higher, did corrosion occur. 2) A 304 stainless steel distillation column was operating in a coastal environment less than a kilometer from the water’s edge. This particular environment is well-known for its high winds and rain blowing into the plant off the salt water. The column was distilling chemicals that required operation in the 90 C range, a perfect temperature for chloride SCC. The column was insulated with mineral fiber, and the specification did not require extra precautions against moisture penetration. After a few years, service leaks began to appear at the welds in the bottom of the column. A corrosion engineer correctly identified the problem as externally induced SCC caused by atmospheric chloride and the inability of the insulation system to keep out water. The column was repaired, and the bottom two meters was coated using an immersion grade epoxy phenolic. Ten years later the column was condemned and replaced because of extensive external SCC on the rest of the column shell. Figure 4 shows the outside surface of a nozzle neck removed from the column. Only that portion of the column that was coated during the first repair was free of SCC. This example clearly shows how effective a remedy coating can be when the probability is high that it will not be possible to keep chloride and moisture out of the insulation. The entire replacement column was coated with epoxy phenolic when it was fabricated and has been SCC-free for many years. The replacement column was insulated using mineral fiber and aluminum jacketing. While this is not the best combination of insulation materials to resist SCC, it is certain that the epoxy phenolic coating will prevent SCC of the new column. The phenomenon of corrosion under insulation has been understood for at least 50 years, yet it continues to cost industry millions of dollars annually. Preventing CUI is not rocket science: The correct application of coatings along with the proper specification, installation, and most importantly, maintenance of today’s insulation materials, will prevent CUI and extend the life of increasingly costly process equipment. This is a metallographic cross section through a piece of 300 series stainless steel that is suffering from severe stress corrosion cracking (SCC). The very fine and highly branched cracks are characteristic of SCC, which grew from bottom to top in this picture. 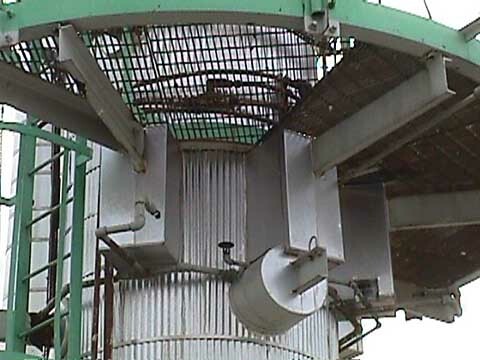 Continuous condensation on this platform support due to the low operating temperature combined with inadequate coatings maintenance resulted in corrosion of the support. These supports had to be repaired. These platform supports are properly insulated and no corrosion is present. 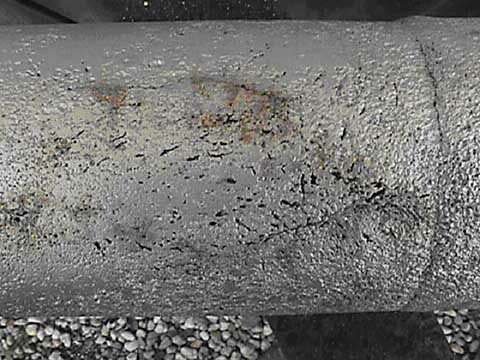 This is an area of extensive external stress corrosion cracking and pitting on a nozzle neck of the distillation column. This area leaked product through the cracks and into the insulation.